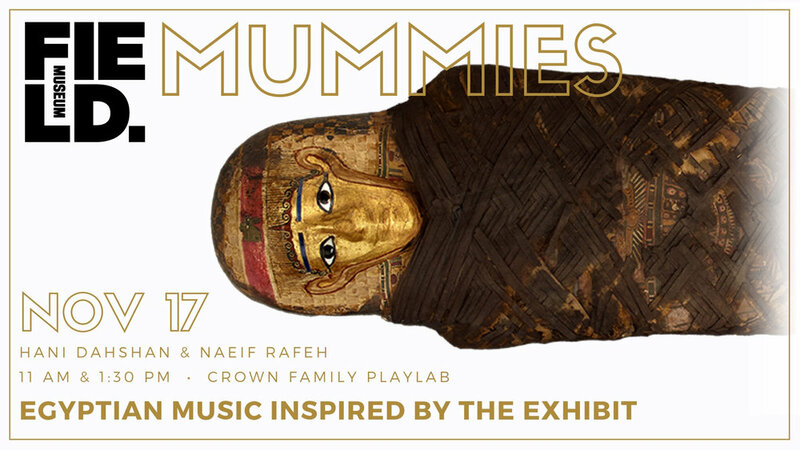 Join us at The Field Museum Saturday November 17th from 11am-2pm for two family-friendly musical performances with Hani Dahshan and Naeif Rafeh, members of the Diwan Al Han Ensemble. Discover the music of Egypt and instrumentation including kanoun (lap harp), oud (lute), and ney (flute). Designed for children between two and six years old, the Crown Family PlayLab is an interactive, hands-on space that makes learning an adventure. Every aspect of the exhibition offers an invitation to curious kids to become junior scientists for the day. Early learners can explore world cultures through music, crawl inside a dinosaur’s nest, or play paleontologist with dinosaur bones—and that’s just the beginning. With opportunities for discovery for young children, this exhibition presents a new adventure every time you visit. The Crown Family PlayLab invites you to join us for Art and Science Spotlight, a special program that brings storytellers, musicians, painters, and other performers to the Museum to meet you and your little one! In Mummies, uncover the lives of the people inside—from their families, work, and religious beliefs, to the objects they chose to bring into the afterlife. This extraordinary, limited-time exhibition features mummies from ancient Peru and Egypt. Made up entirely of objects from our collection, the exhibition includes 14 mummies, intricately decorated coffins and mummy masks, ceramic items, and mummified animals. Seeing ancient Peruvian and Egyptian mummies in the same space brings to light the differences and similarities between these cultures. Using non-invasive CT scanning and other cutting-edge technologies, our scientists can digitally peer through layers dating back thousands of years to reveal the human lives behind the gilded coffins and once-mysterious bundles. Explore their discoveries firsthand through interactive touch tables. These mummies paint a rich picture of people from a different time—and the cultures that lived on after their deaths.